Some of my readers and fellow bloggers may have started to wonder about my lack of posting and answering comments made on my blogs. I am still here and I haven’t abandoned my blogs or my blogging friends. It’s just that over the past few weeks I have been incredibly busy. The hunting season comes to a close on December 10 and I still have not connected with the buck I want. If I didn’t hunt I have been sitting in the office planning for next year and get things rolling in the right direction. The lion share of the time, however, was spent on getting my website finally ready to be launched. I started the basic design two years ago but each time I looked at it I didn’t like something and changed it. Then in the last two months I completely redesigned everything from the ground up and today I am pleased to announce that OthmarVohringer.comhas been successfully launched. There are still a few minor changes and some editing to be made but the bulk of it up and running. At this point it is appropriate to say a big thank you to my wife for putting up with my frustrations – me and modern technology do not go along well -, for her continues artistic input, ideas and inspiration but also for the many hours spent editing and proofreading all the text that still continuous to this day. Thank you from the bottom of my heart, without you this website never have turned out the way I envisioned it. The website will provide information of my many services to the hunting industry. Naturally there is also a lot of information for hunters too in form of articles, tips, product reviews and much more. 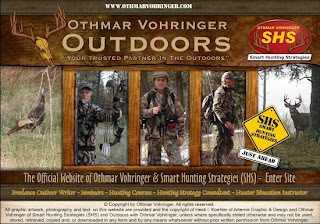 I believe with OthmarVohringer.com I have created a well-rounded information source for everybody within our large hunting community. Take a minute or two and check the website and let me know what you think. I also welcome any suggestions you may have. If you would like to help me in spreading the news about the website please feel free to go to “Press Releases” and download the official media release and a picture of your choice, or link back to this article on your blogs. Thank you! Nice website Othmar, you are now in the big league with this new site. Great Work!